Justified! Think of it! Sinners that we are! What does it MEAN? I like the definition that one child gave. Justified: JUST as IF I’D never sinned. 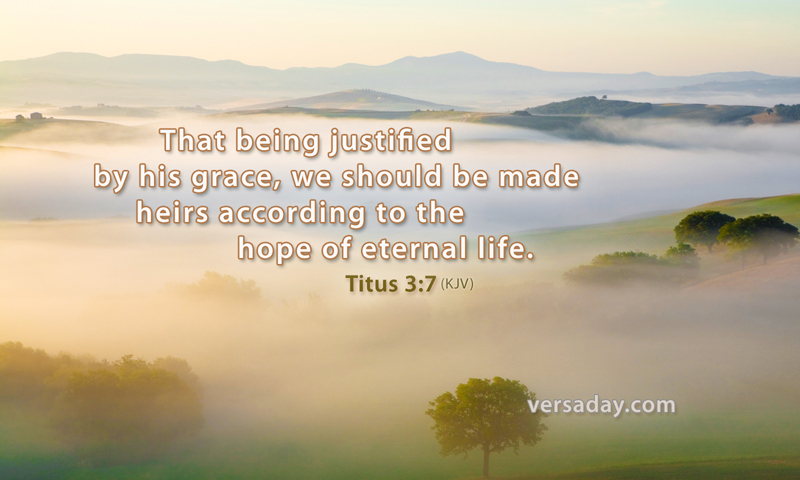 How are we, wretched sinners that we are, going to be justified?........ ONLY by the GRACE of God: not by candles, baptisms, pilgrimages to holy cities, or anything of our doing; purely by the grace of God according to His mercy he saved us. What we have merited by our OWN actions is punishment and contempt, but because the punishment that we deserve was placed on the Son of God Himself, God justifies us freely by His Grace when we repent of our sins and come to Jesus, receiving Him into our heart by faith. When this is sincerely done, God forgives our sin, and we become heirs of ETERNAL LIFE, so that we should do like John Bunyan’s Pilgrim, with our fingers stopping up our ears to the call of the world, and running toward the celestial city and crying out “LIFE, LIFE, ETERNAL LIFE’’. Jesus died in our place and His last will and testament is eternal life for you……..IF YOU WILL HAVE IT.